Denise Margulies – owner and co-founder of Core – understands that the difference between a casual jogger and a serious runner comes down to motivation and knowledge. Denise has years of experience training and participating in marathons and is passionate about inspiring others to achieve their fitness goals. Denise and her husband, fitness expert Michael Margulies, apply their experience and expertise at Core Fitness, New York City’s premier personal training facility which they own and operate. Denise, a mother of two girls, radiates strength, positivity, and confidence – values she hopes to inspire in both her children and in her clients. Denise believes in the importance of empowering women and strives to be a positive role model both in and out of the gym. When she isn’t shaping bodies at Core Fitness, Denise applies her years of running knowledge to helping women reach their full potential. Though she loves running, Denise has a new-found passion for cycling, where she participates in high-level competition and coaching. Denise, a veteran of nine marathons – including New York, Boston, and Hawaii – is a no-nonsense running guru with the mindset that anything is possible. 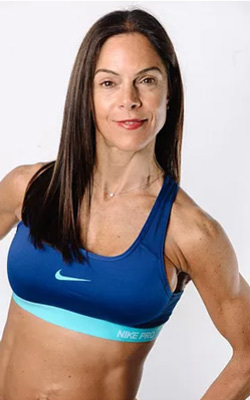 Whether you are a novice jogger or a seasoned athlete, with the help of Denise’s passionate inspiration and structured strength, flexibility, and balance training, you’ll find yourself achieving goals you never thought possible. Denise and the Core Fitness team are proud to be New York City’s preferred trainers; leaders in business, entertainment, and medicine choose Denise as their running coach. Denise and the Core Fitness team are ready to help you reach your full potential and live a happier, healthier life – get started today!